Over the years Carbon Busters has had many good employees but some have left the company in order to go back to university or have changed their careers. Click on the left to read about our alumni staff. Back row: Cecylia Krzesinski, Amy Mireault, Michèle Elsen, Richard Krause, Michael Beblo, Claudia Bolli, Pat Roth, Tamara Millard. Front row: Asmus Stoyke, Godo Stoyke, Shanthu Mano, Eckhart Stoyke. Heidi's extensive experience in facilitating personal interactions and mitigating conflicts made her well suited for her role as contact person for administrators, key teachers and students. Heidi received a Bachelor of Arts in Sociology from the University of Alberta, as well as a Master of Arts in Social Ecology from Goddard College. Public participation and democracy, the topic of her master's thesis, remain her strongest interests. She has worked as an environmental educator at the University of Alberta Devonian Botanic Garden and served as Executive Member of the Board and President of a variety of private and non-profit organizations. Heidi is now retired and living in Edmonton, Alberta. Eckhart Stoyke is the founder of Carbon Busters Inc. (formerly EEC Inc.). He developed the concept behind the Carbon Busters program in 1987. Now retired, Eckhart continues to be interested in the development of new energy saving methods for school buildings and the research of new efficiency technologies. Eckhart received his degree from the Engineering College of Lage, Germany, in 1959. He has worked as an engineer for Canadian and German companies, including Shell, Lufthansa, Polychemical Industries and Dow Chemical. The gas liquefaction plant which he built in 1978 for Dow Chemical used propylene as a cooling agent instead of the ozone destroying CFCs commonly used at the time. Despite the fact that the plant was entirely CFC-free 10 years before the 1987 CFC Montreal Protocol on Substances which are harmful to the Ozone Layer, it was built at below average cost. As part of his duties as representative of the European Chemical Manufacturers on the United Nations Convention on Maritime Pollution Prevention (MARICHEM) in 1980, Eckhart also developed a patented slop recovery system for chemical tankers which allows a cost-effective recovery of 90% of chemical residues. From 1981 to 1993, Eckhart was employed as the sole energy consultant for the 196 schools of the Edmonton Public School Board. In 11 years these schools saved CDN $23 Million in utility bills through his efforts. His energy conservation program was recognized by the award for Best Corporate Program of the Department of Energy, Mines and Resources of the Canadian Government, and the Best Corporate Program Award of the Association of Energy Engineers. His experience in implementing no-cost and low-cost energy conservation programs in schools led Eckhart to run pilot projects of the CarbonBusters program in 150 schools from 1987 to 1993. Since April of 1993, Eckhart was part of the Carbon Busters team worked full-time in implementing Carbon Busters Energy Saving Programs. 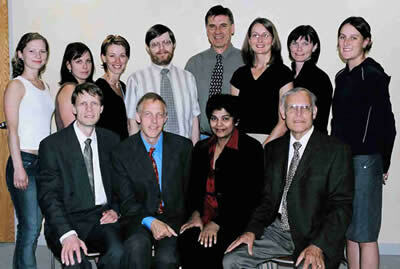 Eckhart is a member of the International Solar Energy Society and the Association of Energy Engineers. Stoyke, Eckhart. 1981. Slops and Residue Disposal - a new approach. In: MariChem 80. Proceedings: Conference on the Marine Transportation, Handling and Storage of Bulk Chemicals (London, 21-23.10.1980). Orion Print Services, Luton, England, 147-153. Pat was part of our team as our accountant. Pat is currently retired. Michèle has a B.Sc. in Environmental and Conservation Sciences from the University of Alberta. She majored in Conservation Biology and Management. She loves the outdoors and cares deeply about the environment. She joined the Carbon Busters team in the spring of 2002 as an environmental educator. She prepared educational materials for the school districts such as action plans and the eco-tips and was responsible for organizing the Carbon Busters workshops and contests. On her days off, Michèle can be found backpacking or hiking in the mountains, and in the winter time she loves to cross-country ski and currently lives in Calgary, Alberta. Claudia Bolli, Bachelor of Education, Dipl. Biol. Sc. Claudia has a teaching degree as well as a Diploma in Biological Sciences. At Carbon Busters, Claudia was involved in the creation of educational materials and the preparation and presentation of workshops. Environmental issues are of great interest to her and she believes that every person can contribute to a healthier planet. After having taught elementary school in French Immersion and German Bilingual programs, Claudia participated in field work related to song birds and waterfowl. In her free time she enjoys gardening, birdwatching, cycling and cross-country skiing and is currently involved in many of Edmonton's permaculture projects. Cecylia was part of the Carbon Busters team as its Office Administrator. Along with her duties at the office, Cecylia joined the energy team at Schools and Municipalities, conducting light audits and compiling light audit reports. Cecylia left to pursue a B.Sc. at the U of A and is interested in German Language Studies and Occupational Therapy. She enjoys snowboarding and traveling. 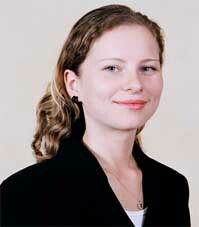 Anna is responsible for our sales and marketing in Germany. She is the newest staff member at Carbon Busters having only started in the fall of 2004. Anna was born and raised in Germany and is still settling in to her new home in Edmonton and so far loves canadian winters. Jillian worked in our marketing department on a part-time basis for several months in 2007. Tamara has a B.Sc. in Biology with a specialization in Environmental Biology from the University of Alberta. As a Carbon Buster Tamara was a part of the Sales and Marketing team and was involved in contacting and communicating with school districts and municipalities. She believes that energy conservation and awareness are very important to help maintain a healthy environment. Her interests outside the office include camping, hiking, snowboarding and yoga. Tamara is back at the university working towards a Bachelor of Education. Alex was with Carbon Busters as a part-time employee for several months. She was on a SWAP (Student Work Abroad Program) from Germany. She has now returned home where she is completing her degree in Geography from the University of Marburg in Germany. At Carbon Busters she was busy developing german educational material for the website. Alex likes downhill skiing, ice hockey and traveling. 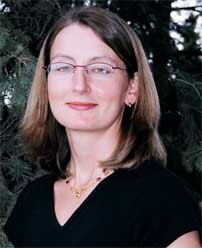 Anne received her Bachelor of Arts with Distinction in Psychology and Sociology from the University of Alberta in 1999. She was EEC's environmental education co-ordinator and developed class-room materials for the education components of CAPS. A dynamic speaker, Anne was a popular environmental presenter in schools. Her main interests lie in analyzing the relationship between globalization processes and environmental degradation as well as what role environmental organizations play in environmental policy a global level, such as atmospheric protection. 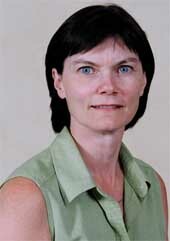 Anne left the company in 2001 to pursue her interest in globalization. She is currently enrolled in a Masters program in Sociology at the University of Alberta. Stephanie joined the team in 2000, and was responsible for the education program and office administration. Stephanie received her Bachelor of Arts with Distinction in German and Ecological Anthropology from the University of Alberta in 1999. Throughout her university years, she developed a keen interest in environmental issues, especially in the development of renewable energy sources. Stephanie believes education is a key factor in creating environmental awareness. Stephanie returned to school in the spring of 2002. She is currently enrolled in a degree in Drama Therapy at the University of Montreal. Bill received his Diploma in Computer Engineering Technology in 1986. He began a lengthy career with a major industrial software company (Taylor Industrial Software). During his time with Taylor, Bill held various positions of increasing authority, culminating in his appointment as Vice President of Sales and Marketing. This position allowed him to manage a multi-million dollar sales and distribution network as well as handle marketing efforts for a major software product. Bill has worked with numerous Fortune 500 companies and assisted them in needs assessment and requirements for major projects. In order to ensure that the customer needs are met with new products/ materials being developed, he has been very successful as the intermediary between customer and product /material development . The development of partnerships between companies has been Bill's focus. As the Manager of Sales and Marketing for EEC (now Carbon Busters) he used his past work experience in bringing efficient energy consumption to school divisions in North America. Bill actively pursued opportunities in North America until June of 2002. He now works for Cartell Communication Systems here in Edmonton, and still drops by for the occasional game of pingpong.